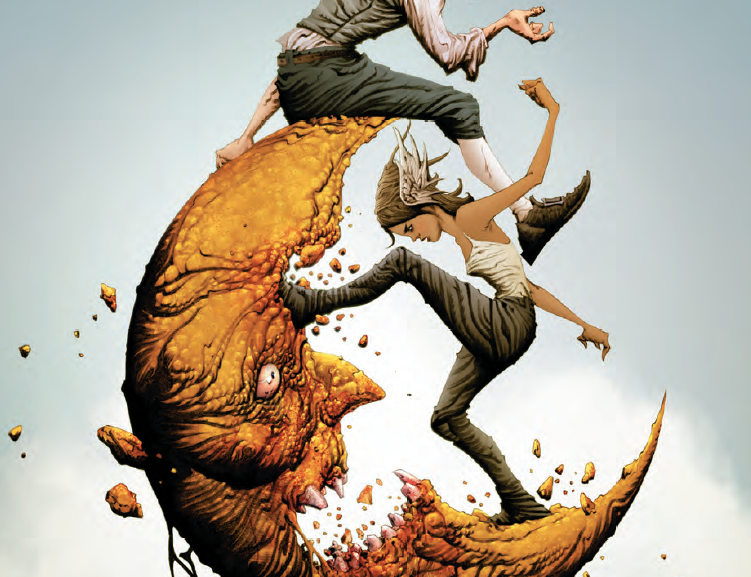 The Dreaming #1 Review – AiPT! Entirely weird and imaginative in the best of ways. The Sandman series is back, which is hard to believe given how long it has been since the character had a title for himself. Then again, maybe he doesn’t here, since he’s missing and much of the story is about his supporting characters trying to make due in his absence. In this first issue we learn a bit more about that and more as The Dreaming literally falls apart. There is a place where stories are born. Today its walls lie slashed and bleeding. Dream has abandoned his realm, and until he is found, its residents must protect its broken borders alone. But the most senior storysmiths are tormented by invasive secrets, the warden Lucien is doubting his own mind–and beyond the gates something horrific waits with tooth and talon. This story kicks off the aptly named story arc “The Kingdom,” which is written by fantasy writer extraordinaire Simon Spurrier (he’s doing great things with The Dark Crystal) and art by the ever talented Bilquis Evely. Mat Lopes assists on colors with letters by Simon Bowland. This is an all-star group of comic creators delivering a story curated by Neil Gaiman. ‘Nuff said? The funny thing about Sandman and the comics he’s been part of is how introspective and thought-provoking they can be. He lives in a realm with very few rules and that allows the weirdness to fly high. There are very strange things going on in this issue that are inexplicable to the reader and even to the characters who live in this world. Dora, more on her later, is very strange and seems to be godlike — yet she’s so unsure of herself even she’s weirded out. A lot of this story is about reaffirming what was said in The Sandman Universe #1. This is entirely focused on the characters who support Sandman and so far there’s a lot of waiting around and hoping to be saved. There appears to be something going on with Dora, who also seems to be the main character of the story so far. While Sandman’s support staff all stand around hoping for their ruler to return Dora is actually doing stuff and continuing to live her life apart from the rest. She’s a bit of an outcast, definitely a rebel, and she’s being given the attention one could argue may mean putting her on a path to become a great hero. Dare I say she’s being groomed by the creators to be a new Sandman? It remains to be seen, but her character is quite the firecracker, sleeping with demons and generally being quite ornery with others. I’m a sucker for Bilquis Evely’s art. I loved her work on Sugar & Spike and Wonder Woman. Her style is highly detailed, very expressive, and compacted to the point where you seem to get more per page than an average artist. Her style is perfect for this book due to its rich tapestry world and strange oddities. She pencils using real materials and that shines through clearly. Mat Lopes’ colors add to her work with fantastic swirls and vivid colors added to the skies of The Dreaming that add layers to its weirdness. The letters by Simon Bowland are great too with the right amount of bolding and some interesting size differences (even in a single bubble) that help convey additional detail to what is said. After The Sandman Universe #1 and now this I’m starting to grow impatient with these characters. Seeing most of them sitting on their hands hoping for their savior to return is growing old. Dora’s journey helps quite a bit, but the rest of the characters are growing tiresome and the plot suffers since they aren’t actively doing anything and instead holding back. That said, there is a major heroic act in this issue by one of them that gives me up they won’t stand by letting this world crumble. The world of Sandman is back with its weird, strange, and deeply thought provoking narrative. This is a first issue that is entirely weird and imaginative in the best of ways. This is a first issue that is entirely weird and imaginative in the best of ways.